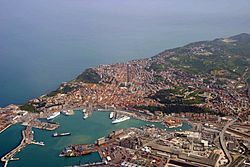 Ancona has a humid subtropical climate (Cfa in the Köppen climate classification). As of 31 December 2015 (2015 -12-31)[update], there are 100,861 persons living in the comune, for a population density of 807.9 inhabitants/km². Ancona Facts for Kids. Kiddle Encyclopedia.